Paris (VNA) – The sound political relations between Vietnam and France will pave the way for the bilateral cooperation in other fields, Chairwoman of the National Assembly of Vietnam Nguyen Thi Kim Ngan and President of the National Assembly of France Richard Ferrand agreed at their talks in Paris on April 1 (local time). Ngan said her ongoing official visit to France aims to maintain and further develop the bilateral strategic partnership and the parliamentary ties, especially realising the commitments reached by the two countries’ leaders on inter-parliamentary cooperation. She said the Vietnam-France friendly relations have been developing strongly and sustainably, particularly since the two sides set up bilateral strategic partnership in 2013. Vietnam always attaches great importance to relations with France in its foreign policy and hopes the two nations will continuously work together to deepen their collaboration, she added. The economic cooperation is a priority pillar in the bilateral strategic partnership, Ngan said, adding that France is Vietnam’s third biggest investor with 2.8 billion USD and fourth trade partner with 5.1 billion USD among the European countries. Vietnam highly appreciates France’s policy of enhancing economic partnership with the Southeast Asian country. More than 200 French enterprises are operating in Vietnam, Chairwoman Ngan said, asking the two sides to support businesses to access to the respective markets. She informed the host about her working session with the France-Vietnam Friendship Parliamentarians’ Group and 15 major businesses from France, adding Vietnam hopes French investors will expand cooperation in the future because Vietnam is a gateway to the Association of Southeast Asian Nations (ASEAN). Through meeting with the French businesses, Chairwoman Ngan said they are very interested in Vietnam and ASEAN with many successful investment projects. Airfrance and Safran – France’s leading aerospace and defence corporation, signed a maintenance and repair deal worth 6.5 billion USD with Vietjet Air. On the occasion, Vietnam Airlines will receive an Airbus A350 aircraft, while Bamboo Airways is also negotiating for its purchase. Considering such result, Ngan stressed French businesses are confident in the Vietnamese market for its stable socio-economic growth and economic openness. She noted that Vietnam has to date signed 12 free trade agreements, adding that the NA recently ratified the Comprehensive and Progressive Agreement for Trans-Pacific Partnership (CPTPP). Vietnam will incorporate international commitments it has inked into the national laws in line with international practice, the top legislator said. At the talks, the NA Chairwoman praised cooperation between Vietnamese and French localities as a special feature in bilateral relations. On the occasion, a conference on the collaboration between the two countries’ localities, its 11th edition, will take place in Toulouse, France, with the participation of 20 Vietnamese localities. It aims at boosting diverse engagement in contribution to the development of the Vietnam – France strategic partnership. Appreciating France’s support to strengthening Vietnam – EU ties, Ngan asked France, as Vietnam’s strategic partner, to assist the country in speeding up the signing and ratification of the EU-Vietnam Free Trade Agreement (EVFTA), which will benefit all sides involved. She also requested the French side back the lifting of EU’s "yellow card" warning to Vietnam, adding that the country is making efforts in implementing related EU recommendations. The NA has approved the revised Law on Fisheries, which responds better to international law on the protection and conservation of aquatic resources. The law came into force on January 1, 2019. Both leaders expressed their delight at robust growth recorded between the two countries’ law-making bodies. Bilateral relations were thriving in the recent past, with increased number of visits by their high-ranking leaders taking place. In March last year, General Secretary of the Communist Party of Vietnam’s Central Committee Nguyen Phu Trong paid an official visit to France, while French Prime Minister Edouard Philippe made an official trip to Vietnam in November the same year. And at the moment, the official visit to France by the NA Chairwoman is ongoing. 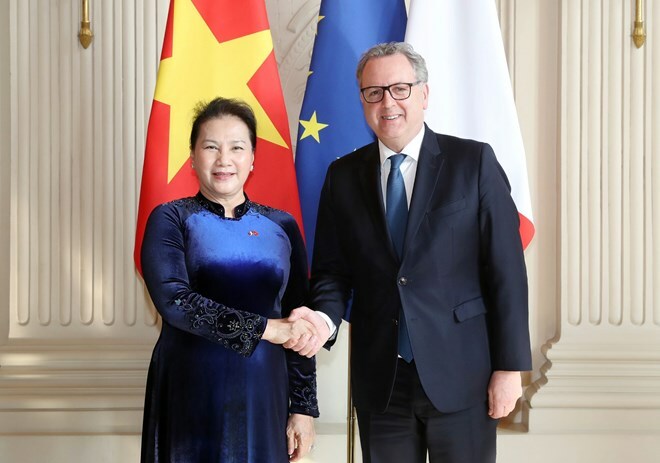 Following his visit to Vietnam in 2018, French Prime Minister Edouard Philippe relished his prospects on the Vietnam-French relation development in the coming time, President of the National Assembly of France Richard Ferrand said, suggesting both sides work together to identify prioritised sectors and outline rational cooperation measures to boost the bilateral relations in an effective manner. He spoke highly of Vietnam’s role in the region and the ASEAN, and expressed his support for the collaborative relations at the local level. Regarding the EVFTA, the official stressed that the French Government and National Assembly support the early signing and ratification of the pact, noting that both sides should work more to accelerate the official signing. Hailing the sound cooperation between civil aviation corporations of the two countries, with a line-up of large contracts having been inked, he said that cooperation in the field is a vivid illustration for the Vietnam-France relations. Meanwhile, NA Chairwoman Nguyen Thi Kim Ngan affirmed that Vietnam stands ready to coordinate with the French National Assembly to bolster bilateral cooperation, making contributions to deepening the good friendship between the two countries. At the talk, Farrand accepted the Vietnamese NA Chairwoman’s invitation and said that he will visit Vietnam with a parliamentary and business delegation to further the cooperative ties.